As both a history buff and a wannabe time traveler, I find that historically significant journals and diaries can be a wonderful way of jumping into the past. In the hands of gifted chroniclers, they offer intimate, we-are-there views of momentous times, blending reportage, observation, context, and some instant reflection and analysis. William Shirer was both a print journalist and a radio reporter in Berlin during the tumultuous 1930s and the early years of the Second World War. In the photo above, we see Shirer writing about the German invasion of Poland on September 1, 1939, regarded as the official launch of the war. He quickly and accurately dismisses attempts by Hitler and his High Command to spin the invasion as a defensive “counter-attack” in response to supposed Polish aggression. 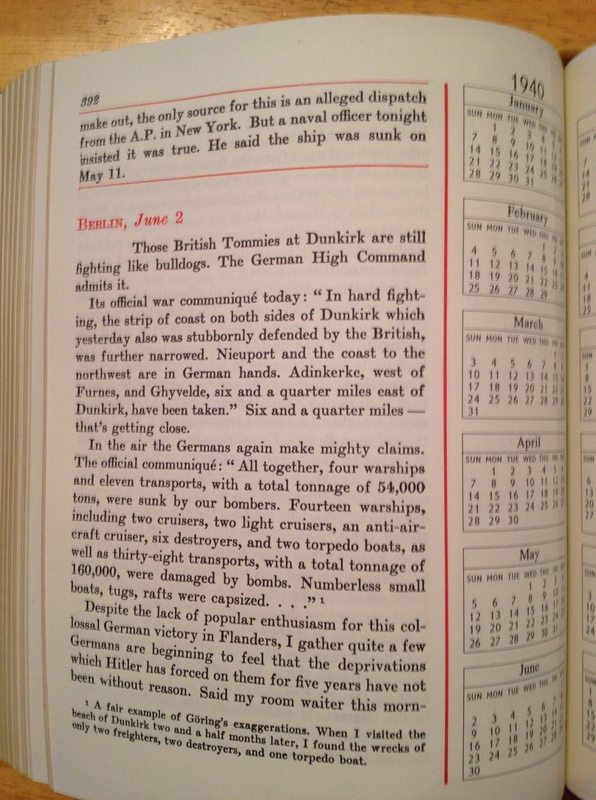 And here’s one of his 1940 entries, writing about the British evacuation of Dunkirk following the fall of France. Note, at the bottom of the page, his observations about how the German people are now regarding the material deprivations they experienced as Germany prepared for war. 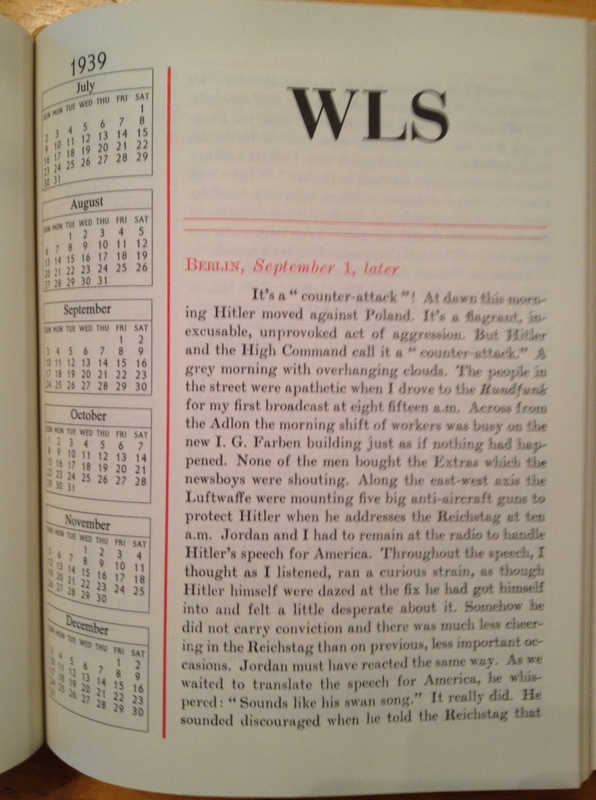 Shirer would go on to write one of the most popular books ever about the war, The Rise and Fall of the Third Reich. John Kenneth Galbraith was an accomplished Harvard economist, liberal political figure, and author of a bestselling (and still relevant) book, The Affluent Society, when he became an advisor to the Kennedy campaign. 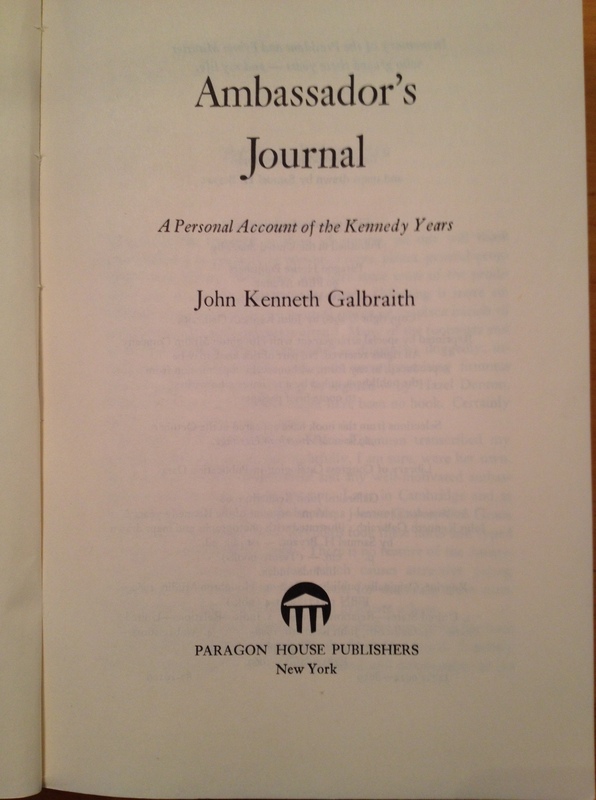 Galbraith’s journal mixes insider stories about the Kennedy Administration, his experiences as Kennedy’s ambassador to India, and texts of letters that he wrote to the President. 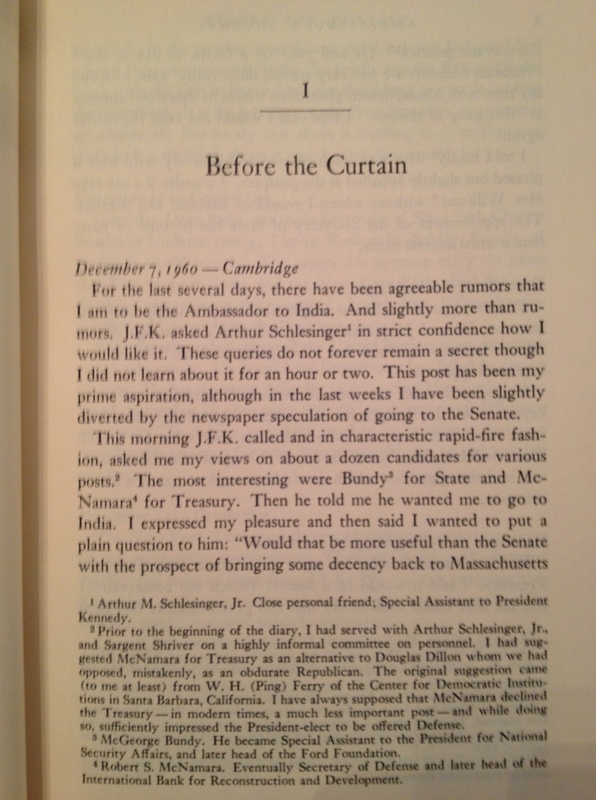 Some of the most interesting parts of the journal recount the period immediately following Kennedy’s election in 1960. In the passage above, Galbraith shares news of his pending diplomatic assignment and his conversation with the President-elect about potential cabinet appointees. 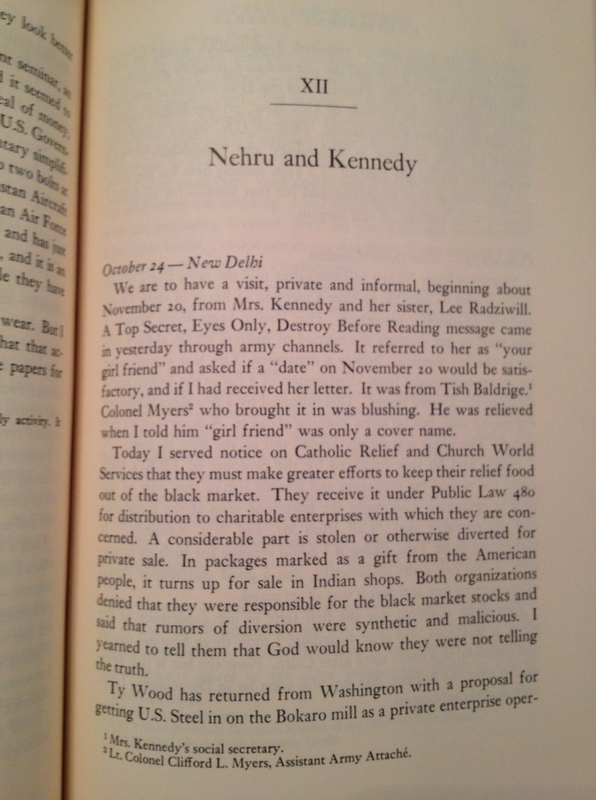 And here’s an entry with news that First Lady Jacqueline Kennedy will be making a short, informal trip to India, along with some humorous details about how Galbraith has been instructed to keep the visit confidential for now. When it comes to journals and diaries from historically significant times, I much prefer the prose of observers such as Shirer and Galbraith over tawdry tell-all tales designed to sell books and attract talk show invitations. Shirer was a reporter, while Galbraith was a participant, but both journals share levels of restraint, sans the kind of voyeuristic detail we might expect in similar efforts today. They are also fascinating to read, drawing us into different times and places. In the absence of time travel machines, books like these are pretty good substitutes. Time travel: Some favorite destinations (2013) — If I could go back in time, here’s my list! A bookstore visit triggers memories of meeting an intellectual hero (2014) — My meeting with John Kenneth Galbraith, weeks before he passed away. Hi Dave, that is a beautiful edition of “Berlin Diary” that you have featured. It was a great idea by someone at Easton Press to include a calendar on the side. I also love that book but your edition is definitely superior. I will have to get a copy of the John Kenneth Galbraith book as well. Is that the book that he signed immediately before his death and his assistant sent subsequently sent to you? A wonderful momento. Hi Don, thanks for your note! I found the Easton Press edition of the Shirer diary at the Brattle Book Shop. 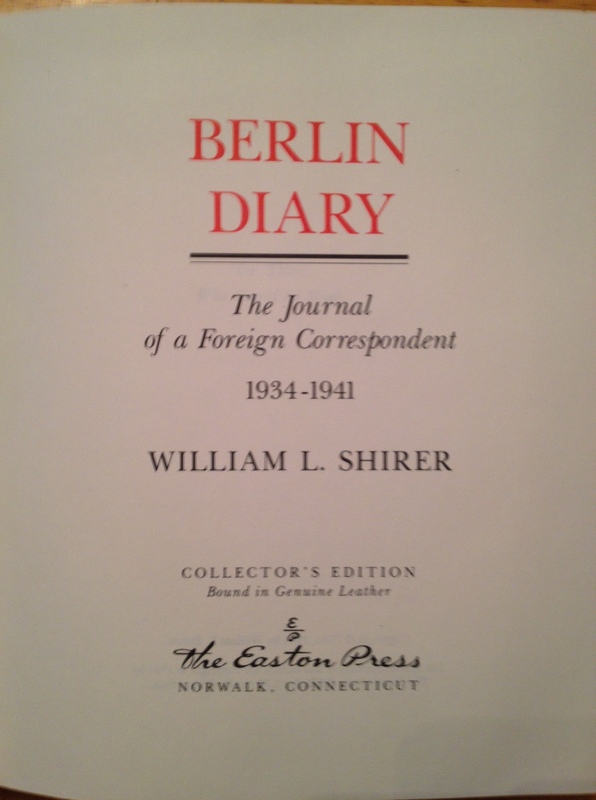 There is an accompanying volume that I didn’t know about: Shirer returned to Berlin right after the war, which resulted in a shorter diary covering 1945-46. I was fortunate that the set showed up together at Brattle. My older copy of the diary is a fraying one published back in 1941, which I recall buying at that huge annual Brandeis U used book sale in Wilmette while we were in college. The Galbraith journal is a copy I picked up online. The book he inscribed was the last edition of The Affluent Society. I looked at it just the other day…it’s definitely a keepsake!